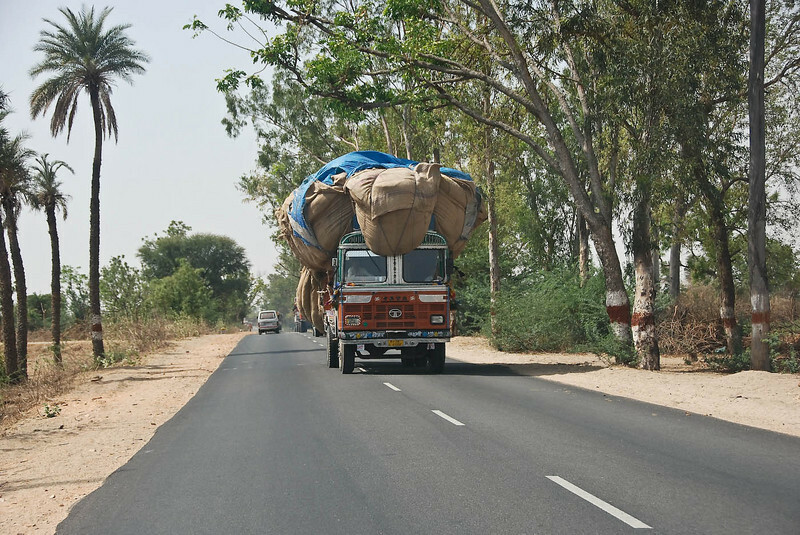 In April, the roads in rural Rajasthan were filled with these colourful grain trucks, loaded up to tipping point with grain. All vehicles constantly toot horns to let the other drivers know they are there. The white line down the centre of the road counts for nothing and after a while you get accustomed to the narrow misses. You end up sharing the roads, including the main inter-city highways with Tato buses and trucks (they have the loudest horns), cars, horse-drawn carts, buffalo-drawn carts, camel-drawn carts, motorcycles, auto rickshaws, cycle rickshaws, bicycles, pedestrians, and of course goat herds, dogs and buffalo. Holy cows will often stand in the middle of the road, motionless for half an hour and of all vehicles on the road they are respected the most.